John Steinbeck is regarded as one of the greatest writers in the English language and we as Californians can be very proud that he is ours. The Carlsbad Library is celebrating Steinbeck in the month of April as the community reads Steinbeck’s classic road book Travels With Charlie: In Search of America. Steinbeck’s son Thomas Steinbeck wlll discuss his legendary father in person on Saturday, April 24, 2010. If we can get if for our Kindle app, we’re on it. 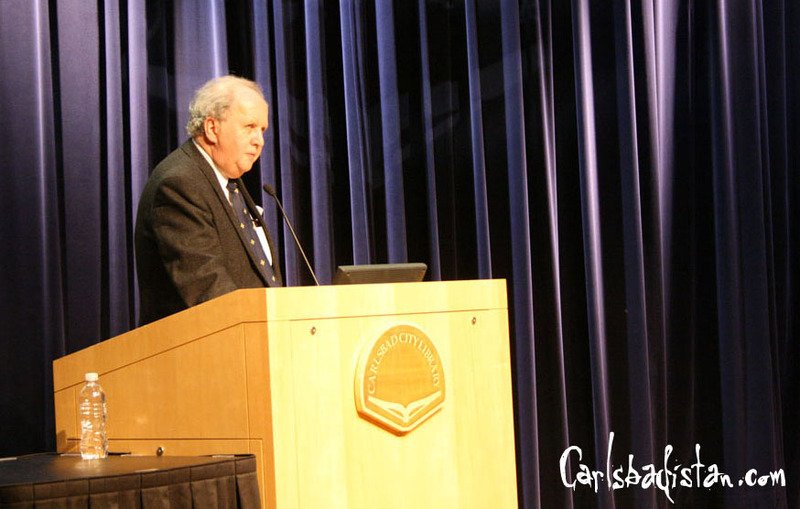 For more information on all the Steinbeck events in April follow the jump. Carlsbadistan’s emmy award winning radio and television news reporter Elizabeth Sanchez has a new self-published book out titled Watercooler: Behind the Scenes and Off the Record, the Untold Stories of Broadcasters, according to a story in the North County Times. On Friday, September 25, 2009 the Carlsbad City Library will be celebrating its 10th year anniversary with a free celebration from 3:30 to 4:30 PM in the courtyard. Highlights include music by guitarist Patrick Berrogain, children’s activities, then-and-now displays, and refreshments. 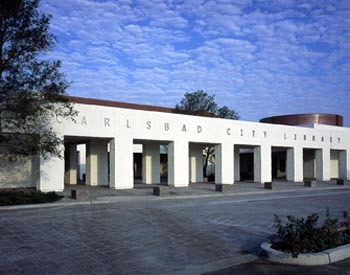 Carlsbad City Library is located at 1775 Dove Lane in southern Carlsbad. 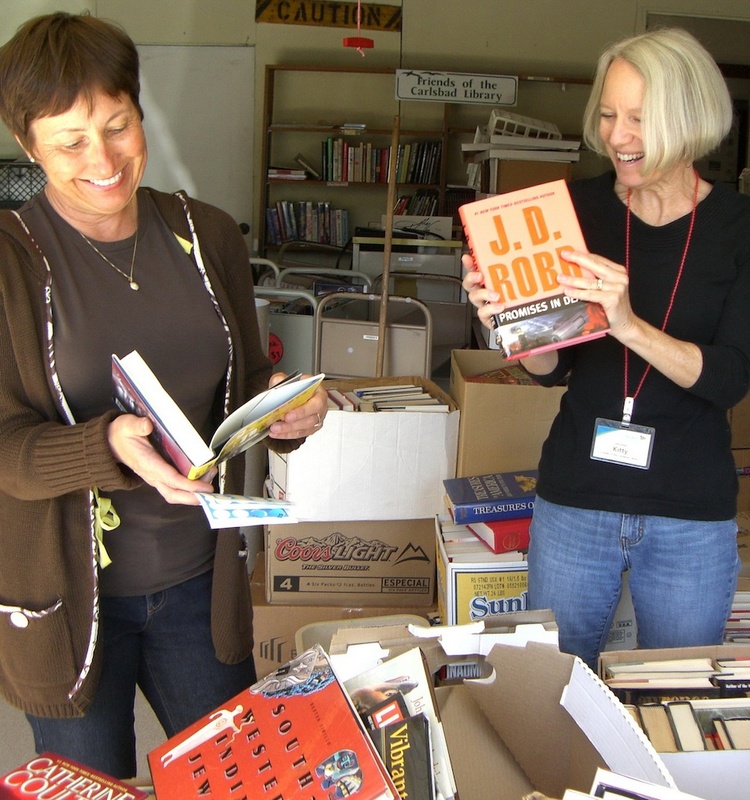 Follow the jump for more information or call 760-602-2012 or visit www.carlsbadlibrary.org. Carlsbadistan resident and former English professor Daniel Van Tassel, 61, has recently self-published a 140-page book of short essays about growing up in Barron, Wisconsin in the 50s. 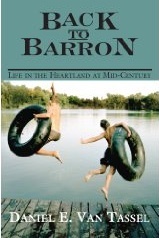 It’s called Back To Barron: The Heartland At Mid-Century. Six years ago, while recovering from an ankle injury, Van Tassel started writing the essays. The subjects included being in the Boy Scouts, competing in spelling bees and going ice skating. . . “It came together in the next year or two, but I kept adding and revising,” he said. Van Tassel lined up North Star Press of St. Cloud, Minn., to print the book. So far, he’s sold nearly 1,000 copies. Most of the books have been purchased in Barron County, but he’s sold some across the Midwest, and said he’s pleased with the responses he has received. Seems quite a few Midwesterners end up in Carlsbadistan. 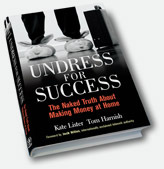 If you did, then check out Van Tassel’s book by clicking here. Self-help goddess Louise Hay, 81, is one of the best-selling women writers in history and her publishing company Hay House Publishing is based in Carlsbad. The New York Times is featuring a comprehensive profile on the woman who is responsible for a self-improvement empire that works with some of the biggest names in the business. Today the company turns out books, CDs, calendars and card decks by many of the titans of the large world that booksellers are now calling “Mind/Body/Spirit,” a category that includes the literature of psychics/intuitives, angel therapy, positive thinking, New Thought, water therapy and motivational speaking. Wayne Dyer, Suze Orman, Deepak Chopra, Marianne Williamson, Sylvia Browne and Doreen Virtue are all Hay House clients. 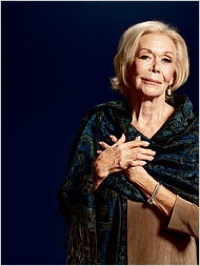 Last year, Hay House — which is owned jointly by Louise Hay and the company president, Reid Tracy, 45 — sold 6.3 million products, taking in $100 million, 8 percent of which was profit. Selling solutions to those who hunger for help sounds like a great market, huh? Click the link for the rest of the Hay House story. 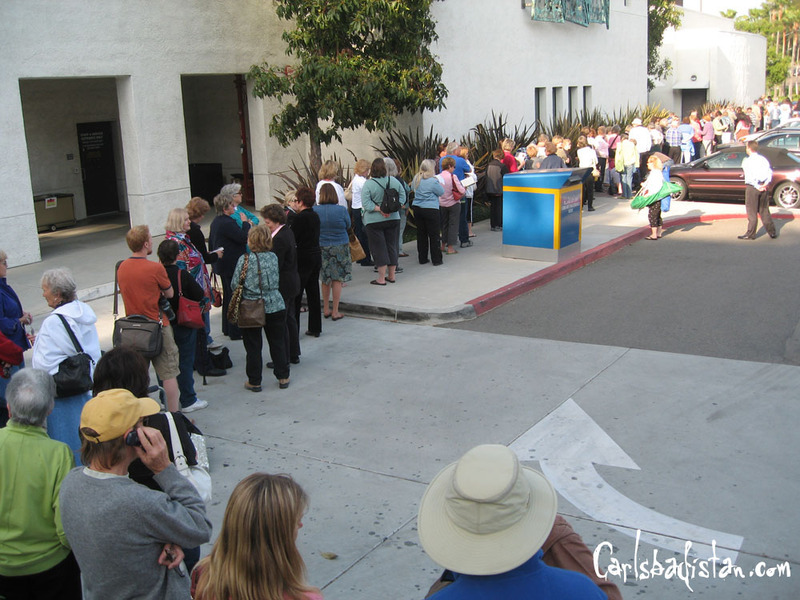 By 5:15 PM yesterday the line for tickets to see popular fiction writer and Carlsbad Reads author Alexander McCall Smith snaked across the front of Carlsbad’s Dove Library, around the corner, and all the way into the back of the parking lot. “This is like a rock concert or something,” one woman said as she and her friends searched for the end of the line. By 7 PM everyone with a ticket had filed into the the Ruby G. Schulman Auditorium and the George and Patricia Gowland Meeting room where the overflow audience could watch the lecture on closed circuit TV. When the stage curtains parted there was the jolly Scot Alexander McCall Smith in his suit jacket, tie, and kilt. Exactly as most everyone expected. Fans of the The No. 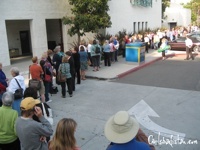 1 Ladies’ Detective Precious Ramotswe will be standing on line at the Carlsbad Library on Dove Lane this afternoon waiting for free tickets to hear Scottish law professor/best-selling author Alexander McCall Smith speak as part of Carlsbad Read Together. 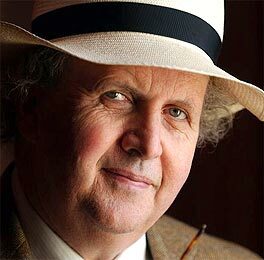 Some who have heard McCall Smith speak say he is one of the most entertaining, enlightening speakers they have heard and that his lecture should not be missed. Bring a chair and a couple McCall Smith books and join the lit line party. Carlsbad resident David Roderick was “a 20-year-old sergeant with the 4th Infantry Division when he waded onto nearby Utah Beach on June 6, 1944,” according to a story in the central Illinois Herald Review. Apparently, Marueen LoBue isn’t the only one in Carlsbadistan who is into self publishing. He recently published a book, “Utah Beach,” partly to give credit to all the sailors, airmen and airborne soldiers who helped make the landing of his division such a great success. . . . “I’ve always been a little bit aggravated at the media and films who always emphasize the carnage at Omaha Beach,” said Roderick, 84. “I thought I’d try to clarify the issue at Utah.” . . . With the help of Web sites on World War II veterans, Roderick tells the stories of sailors whose ships were sunk in the English Channel while shelling German positions onshore. He also credits the Army Air Force, especially P-47 Thunderbolt pilots, and the Airborne soldiers of the 82nd and 101st divisions, with clearing the way for soldiers to survive. If you’d like a copy of Roderick’s book simply send $25 to: David Roderick, 923 Marguerite Lane, Carlsbad, CA 92011.